The history of Holland Michigan is a classic American tale of hard work, resilience, and triumph. From its very beginnings, Holland provided a refuge for those seeking freedom of expression and a more vibrant economy. Persuaded by religious oppression and economic depression, a group of 60 men, women, and children, led by Albertus C. VanRaalte, prepared for their 47-day trip from Rotterdam to New York. VanRaalte intended to purchase land in Wisconsin, but travel delays and an early winter caused the group to layover in Detroit. After hearing about available lands in west Michigan, VanRaalte decided to scout the territory. They reached their destination on February 9, 1847 on the banks of Black Lake—today’s Lake Macatawa. In 1850, VanRaalte donated another tract of land for an academy to prepare young men for advanced study. The next year, the Pioneer School opened on this site, and four years later the institution was renamed the Holland Academy. In 1859, the campus was enlarged to sixteen acres, and eventually evolved into Hope College. By 1871, two railroads extended spurs to Holland, indicating that this was a stable city with a growing future. However, in October of that year, a wind-fed fire struck the city and all of Holland was ablaze. With their hard-earned possessions destroyed, Holland was bankrupt and its people reeled from the toughest blow of all. But not even this calamity could diminish the hopes of the stout-hearted citizens. Plans for a twenty-fifth anniversary proceeded vigorously, and the citizens held a great celebration in September of the following year. Over the next several years, Holland made a slow but steady revival with help from surrounding communities. Once back on its feet, Holland introduced many conveniences to its residents, including the city’s first telephone system, public water system, electrical service, and free mail delivery. And at the end of the 19th century, Holland’s excellent transportation facilities spurred much economic growth, including new furniture and other manufacturing plants, lumber-related industries, and a thriving agricultural market. This era also marked the beginning of the long history of Holland as a tourist destination. Visitors were attracted to the picturesque sand dunes at the mouth of the Black River and the miles of dazzling sugar sand beaches stretching along Lake Michigan. Resort hotels sprang up, including the lavish Hotel Ottawa (later called the Ottawa Beach Hotel) and Hotel Macatawa. The beginning of the 20th century brought even more industries to Holland. Soon, the city was noted not only for its furniture manufacturers, but also many other famous businesses such as the Holland Furnace company, Heinz Pickle factory, and the Bush and Lane Piano Company. After World War I, these and other businesses thrived, as did the tourist industry. The burgeoning resorts at Macatawa Park and Ottawa Beach attracted thousands of vacationers during the 1920’s. Another draw was the Getz Farm with its greenhouses filled with rare plants and private zoo with exotic animals. On November 6, 1923, Holland lost the Ottawa Beach Hotel to fire. The loss of this landmark proved beneficial in the long run as the State Park Board purchased the land, and created the Holland State Park. The 1920’s also brought Holland’s most enduring and famous festival—Tulip Time. In 1927, Lida Rogers, a biology teacher at Holland High School, suggested the planting of flowers as a community beautification project. In 1928, the city imported tulip bulbs from the Netherlands and planted them along the street curbs and in the parks—a tradition that continues to this day. The first advertisements for Tulip Time appeared in 1930, and 50,000 visitors showed up. The following year, 175,000 tourists arrived for the event. The history of Holland includes the suffering caused by the Great Depression. Holland even had its own infamous “Bonnie and Clyde” style bank robbery on September 29, 1932. Despite the hard times, many area farmers earned a good living through hard work and cooperation, and many failed businesses were succeeded by new enterprises that sustained the local economy. During World War II, not only did many of the city’s businesses manufacture vital defense needs, but thousands of residents signed up for duty. In fact, by the war’s end, Holland servicemen had served our country to a degree greater than most communities of a similar size. In 1947, Holland celebrated its centennial with four days of activities in August. Events included an exhibition of art objects sent from the Dutch government, a dramatic production about the arrival of the Dutch pioneers, barbershop singing, and the consumption of a gigantic cake decorated with a replica of the first log cabin. The industrial evolution that had kept Holland’s economy vital for nearly a century continued in the post war era. Hope College saw enrollment jump from 400 in 1945 to 1,200 in 1947 due to a rush of veterans capitalizing on the GI Bill. During the next few years, Hope emerged as one of the country’s leading producers of candidates for Ph.D. chemistry degrees. In 1959, the Chicago Tribune rated Hope as one of the nation’s ten best liberal arts colleges. As late as the 1950’s, Holland still boasted of its ethnically homogeneous population, with ninety percent Dutch heritage. But during the Vietnam era, the city that had so successfully retained its traditional atmosphere also found itself a community in transition. New industries and the resultant population growth produced a building boom. Old traditions, such as closing downtown shops on Wednesday afternoons, gradually succumbed to more mainstream practices. Through the sponsorship of various churches, there was an influx of Latino families and Southeast Asian refugees. Holland became a community in flux in other ways as well. Dozens of suburban housing developments spread across the surrounding townships. Fast food restaurants, outlet stores, and shopping centers increasingly lined the U.S. 31 corridor. Holland’s downtown core faced the same deterioration that had plagued most other cities. But many organizations and individuals, in particular Ed and Elsa Prince, fought back to preserve the best of what downtown Holland had long been to the community. In 1988, the Princes saved the historic Tower Clock building from the wrecking ball. That year, the city completed its Streetscape project complete with an underground snowmelt system. Soon, three parks were added to the downtown. The 1990’s brought continued revitalization to downtown with the restoration of the Amtrak Railroad Station, the conversion of the old Post Office into the Holland Museum, and Hope College’s restoration of the Knickerbocker Theatre. Architecturally-pleasing buildings also arose, including the Freedom Village campus, the new Post Office, and Hope College’s Haworth Inn and Conference Center. After the turn of yet another century, Holland continues to both honor its traditions and refine, update, and expand its appeal. 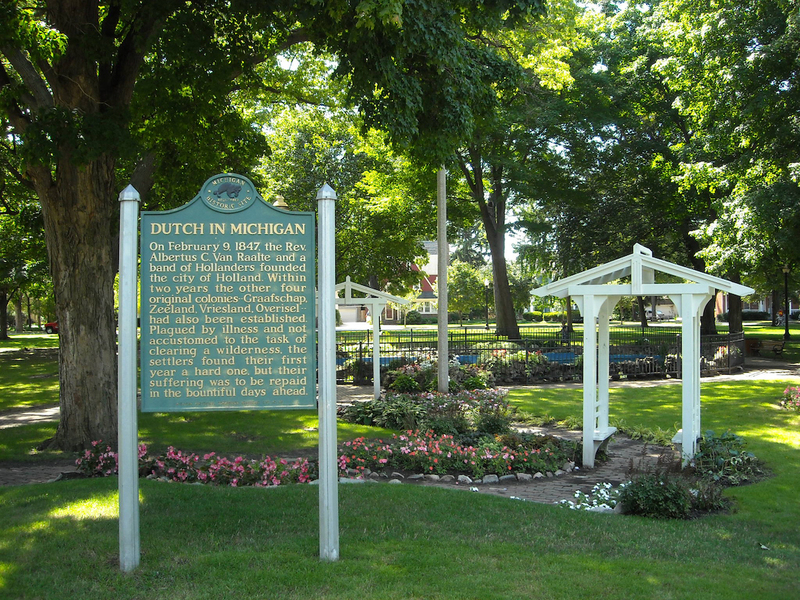 In the last decade, Holland has received many prestigious awards, including one of the country’s “Dozen Distinctive Destinations” and a “Great American Mainstreet” from the National Trust for Historic Preservation; “All America City” from the National Civic League; “One of the Top Five Places to Retire” from Money Magazine; and “One of the Top Ten” in A.G. Edwards’ Nest Egg Index. Downtown Holland, already a popular destination, has become increasingly vibrant, with special events throughout the year, and a combination of cherished businesses and new hot spots. Street performers and outdoor concerts entertain residents and tourists in the summer; al fresco dining is now available at most restaurants; and city parks continue to enhance their landscaping and amenities. In the winter, the snow still melts on those downtown sidewalks and streets, allowing visitors to enjoy all the holiday festivities. Autumn still brings a bountiful harvest to the Farmer’s Market, and old traditions like Tulip Time along with newer ones like Fiesta! continue to enliven the spring. After all its challenges, Holland not only evolved into what its founders had hoped and struggled for, but continues to rise well beyond their expectations.